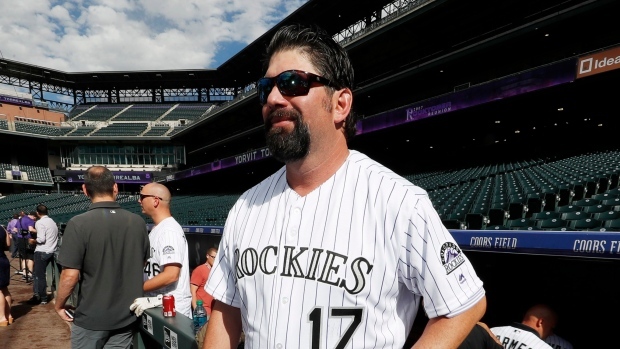 KNOXVILLE, Tenn. — Former All-Star first baseman Todd Helton has received a misdemeanour citation on a charge of driving under the influence after getting involved in a one-car accident. Helton's lawyer says the former Colorado Rockies star has entered a residential treatment program. "He realizes there are parts of his behaviour that need to change, and he is focused on doing just that," Stephen Ross Johnson said in a statement. According to a Knox County sheriff's report, Helton's car struck a telephone pole March 18 before 6 p.m. Officers said Helton indicated he had taken an Ambien at about 2 p.m. One officer saw a cup in Helton's car that "had the odour of an alcoholic beverage." Officers said they were unable to conduct field sobriety tests or interview Helton in depth on the scene because he was being transported to a hospital for further evaluation. They said that "due to the totality of the circumstances, and due to the arrestee needing immediate medical treatment away from the scene," Helton was given a misdemeanour citation "in lieu of custodial arrest." Johnson said Helton required emergency medical care but wasn't seriously injured. Officers said Helton voluntarily gave blood for chemical testing while at the hospital. Helton, 45, retired in 2013 after spending his entire 17-year playing career with the Rockies. The five-time All-Star remains Colorado's career leader in numerous hitting categories, including hits (2,519), homers (369), runs (1,401), RBIs (1,406) and total bases (4,292). He had a DUI arrest in Colorado in 2013.